Motorola DROID Bionic is one of the best and powerful Android phone in on Verizon shelves for a long time. It also has one of the highest price tag in US too. But it seems before the launching of Nexus Prime Verizon knows that it will clever to reduce rest of the pack price to make themselves more affordable. You can now buy the DROID Bionic both in 2-year contract and month to month offer. Month to month price is $590 as 2-year contract is $200 as I said earlier. 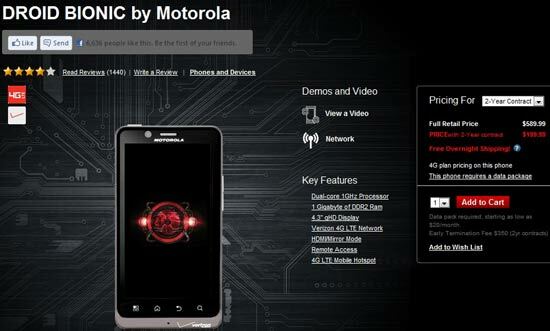 Motorola DROID Bionic is still a powerful beast with 1GHz dual-core CPU with 1GB of DDR2 RAM inside. It has 4.3-inch 960x540 qHD display with 8 megapixel camera on the pack. It’s also in queue for latest Ice Cream Sandwich OS delivery. Check out Verizon official website for more details.